The Draft Flood Management Strategy has been in developed with input from over 57 stakeholders including government, community and business. It outlines a framework for flood management in the Port Phillip and Westernport region, and supports all organisations to work together to prevent and reduce the risk of floods. The Revised Draft Floodplain Management Strategy provides the proposed policy framework for managing floodplains and responding to flooding in cities, towns and regional areas. 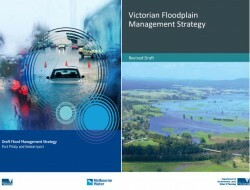 It includes recommendations for improving floodplain management identified during the 2010, 2011 and 2012 floods, the review into the effectiveness of flood warning and response systems, and the inquiry into flood mitigation infrastructure. It also incorporates feedback received during the 2014 consultation. The Victorian community is invited to make a written submission by 5pm, 8 August 2015.